You'll be £12.99 closer to your next £10.00 credit when you purchase Badges & Uniforms of the RAF. What's this? High quality colour photographs of virtually evry badge described in the text. The scope of the book was commendably wide. It was thus a valuable aid to anyone collecting RAF badges – and a useful reminder to those of us who would otherwise have forgotten some of the less common badges and accoutrements that have adorned RAF uniform over the years. A definitive guide to badges worn by the Flying Corps, Royal Air Force and auxiliary units. This vital work is ideal for those militaria collectors and all those with a particular interest in the history of the RAF and aviation. The book contains many colour photographs displaying various examples of cloth and metal badges, but the real treasure is the written sections. Aside from describing the imagery, they give interesting background history and details, such as why the RAF adopted the laurel wreath, as well as explaining the history of the youngest service, from its earliest days as the RFC. Hobart's evident experience with the workings of the Royal Air Force, together with his impressive research justifies his choice of images, thus creating a valuable insight into RAF badges, and the service itself. It is an excellent and successful overview of what is essentially an immense subject. Fairly priced and conveniently sized, it would be a suitable companion for new collectors, as well as more advanced collectors who share an interest in the RAF and its uniforms. The personnel of the RAF proudly wore their uniform and insignia. Their aspect of the RAF’s history is the focus of this book. It covers the RAF, its predecessors (the RFC & RNAS), the Women’s Royal Air Force (WRAF), the RAF Reserve and Auxiliary formations, the Air Training Corps (ATC) and the little-known Royal Observer Corps (ROC). Undoubtedly it is destined to become the standard reference work on this subject. The main aim of the book is to aid identification of uniforms and insignia and to describe their significance. This objective is easily accomplished by their volume. The book is structured in an easy to use format which significantly aids these aims. 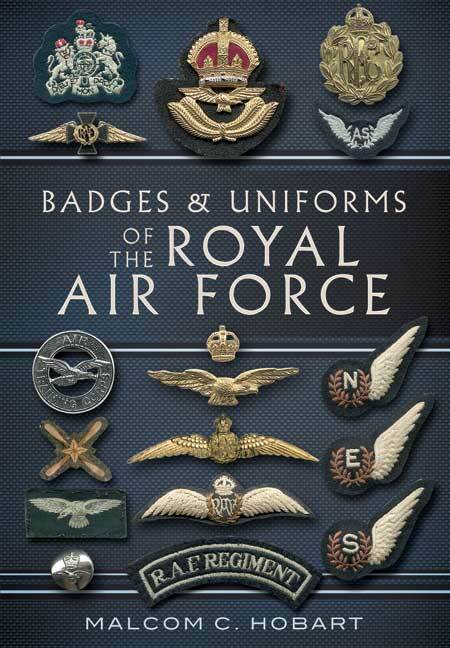 Each chapter is lavishly illustrated with excellent photographs/ images of the myriad of badges worn by RAF and its associated personnel. One has to congratulate the author on his superb work and I am confident that this book is going to become the standard reference book on this topic.